SOUTH BURLINGTON – In a controversial move this week, the Federal Aviation Administration (FAA) has purchased the entire city of South Burlington after complaints were made about potential noise pollution stemming from the incoming F-35 fighter jets. An impromptu Q&A session was held with the community in which residents were not permitted ask questions, but were only allowed to communicate via written messages and charades gestures. When resistance to the proposed quadrupling of jet noise grew heated, an FAA official threw his hands up in the air and purchased the entire town. Termination of tenancy notices are being delivered today to every residential and commercial address in South Burlington, giving everyone between 60 and 90 days to move out of what used to be the city of South Burlington. Homeowners will be given up to 180 days to cash their checks and vacate. Where they will all go has yet to be determined, as there is already a housing shortage in the state. 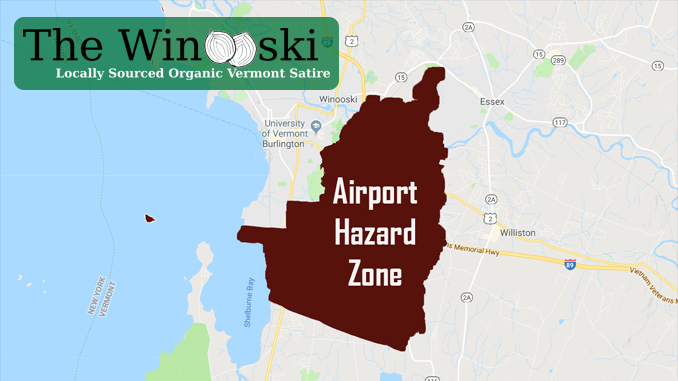 The FAA has also sent notice to neighboring communities such as Winooski and Williston, saying that if they don’t like the noisy jets flying overhead, the FAA would be happy to purchase their towns and evict them as well. South Burlingtonians could just move north to South Canada. This can’t really be happening, can it? Surely this will not stand up in court. Sound like Leahey was on the wrong side of this one. Take it right to his office ……would be a good place to have a sit in. It got me too, wow! But it’s satire.